Do you ever feel like you are ready to give up on finding love? Like it’s just not ever going to happen for you? 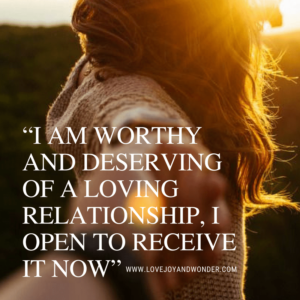 Well, before you throw in the towel, it might be time for you to try a new approach – an attracting love mantra. You might not think they work, but for centuries people have been using mantras and successfully manifesting their soulmate. The dating process is full of highs and lows, this is a normal part of life. However, if you’re finding yourself having more lows than highs, you could be unknowingly running negative programming that is preventing you from finding the one. Struggling to understand why you’re still single and leaving you feeling lonely, hopeless and full of doubt that love is ever going to happen for you. What you focus on grows, and the results of what we receive and experience in our life is the sum total of our subconscious thoughts, feelings and emotions. Most of our current programming was created at a young age and is then reinforced over our entire lifetime of experiences. Running on autopilot on such a deep level, that often no amount of logic will be able to help you change it. In order to have a new experience and get to the deeply rooted beliefs that are holding you back, you must change old stories and reprogram yourself to get more of what you want. There are several ways to to do this, once such way is to use a powerful mantra. Mantras are sounds, that are formed when speaking ancient Sanskrit syllables. These sacred sounds profoundly influence the subconscious mind and are used to help heal and transform the mind, body and spirit. From love to abundance and money, there are many different kinds of mantras to help you shift your energy and manifest what you want. Using the power of vibrational sound, they’re able to bypass current programming and reach the deepest layers of the subconscious. While working to balance and harmonize, they also help to instill new more positive beliefs. We create our life and relationships through our subconscious, as well as through our intentions and emotions. 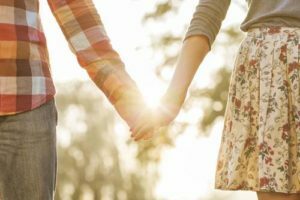 In order to draw your soulmate to you its important to get really clear on the qualities of your ideal partner as well as what it will feel like to actually be with them. 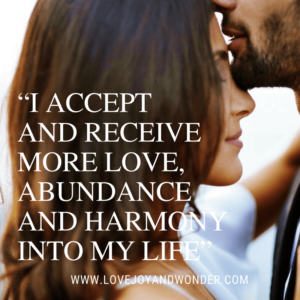 Getting clear on your love intentions and in combination with being devoted to working with your mantra, is essential to attracting and magnetizing soulmate love. This mantra helps to create irresistible attraction, and is associated with love, abundance, beauty and nature. To Use: Chant “Kleem” sounds like KlEEEEEEEEM with an drawn out “E” sounds. 108 times in a row daily while deeply breathing in and out. Imagine totally embodying the sound as it permeates every cell in your body. You may find it helpful to chant along to a video, we like this one. This mantra is used to enhance charm, sexual energy and attract and sustain a loving and passionate relationship. To Use: Chant Om Kama Devaya Vidhmahe, Pushpa Vanaya Dheemahe,Thanno Kama Prachodayath 108 times in a row daily for 40 days. As you chant inhale deeply through the nose, breathing in and out. Let the sound run through you and permeate every cell in your body. You may find it helpful to chant along to a video HERE. We attract to us, that at which the level of frequency that we are vibrating. In other words like attracts like, LOVE attracts LOVE. 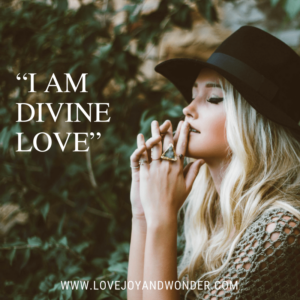 This mantra translates to “I Am Divine Love” and connects you to the energy of all that exists. The more you embody the energy of divine love, the more love you will attract into your life. To Use: Chant Aham Prema for 108 times in a row daily for 40 days. You may find it helpful to chant along to a video HERE. When translated this ancient Vedic mantra means “please bring me a man of truth and goodness” and is used for a woman seeking a man. To Use: Chant Sat Patim Dehi (pronounced: Saht Pah-teem Day-hee) 108 times a day for 40 days. You may find it helpful to chant along to a video HERE. When translated this ancient Vedic mantra means “please bring me a woman of truth and beauty”and is used when a man seeks a woman. To Use: Patneem Manoramam Dehi (pronounced: Paht-neem Mah-nor-a-mahm Day-hee) 108 times a day for 40 days. You can chant along with a video HERE. Traditional mantras evoke the sacred sounds of the universe to harmonize and balance our energy and body. 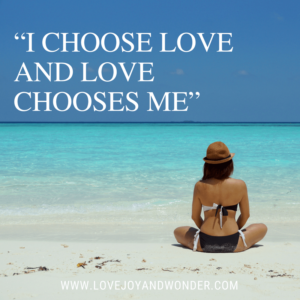 Affirmations connect more with the logical mind and physical manifestation of what we want. As a result they don’t integrate smoothly or quickly into the subconscious mind. 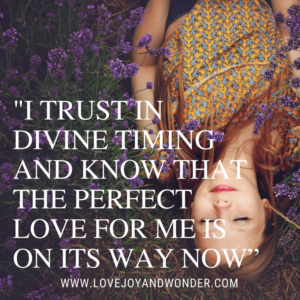 This is why if you don’t understand how to do an affirmation properly, it can take years for it to work. In order to make an English language (or any other non sacred language) based mantra effective. you must get into the feeling of it. It cannot work by just repeating it without the feeling because it doesn’t use the ancient syllables. Concentrate on the feeling you will experience when you are with your partner. How does it feel to be in a loving relationship, to be with them, to be cared for and adored? As with the traditional Sanskrit mantras repeat each mantra 108 times in a row, daily for 40 consecutive days. Why Are Mantras Chanted In Repetition 108 Times For 40 Days? Changing your old patterns and programming is going to take time, with consistent effort and devotion 40 days can break old habits and rewire you with new ones. It’s important to the integrity of the Mantra that you chant it for 40 Days consecutively. If you skip a day you must start over. If you need to start from the beginning, don’t beat yourself up about it, just do it. 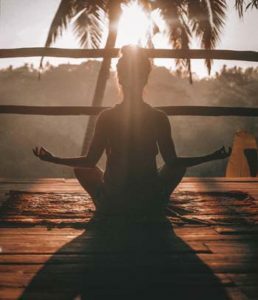 Before you begin your mantra practice, take a moment to get quiet, connect with your higher self and set the intention to attract the love you desire. Mala beads are used in mediation and for chanting. They have 108 beads that you move your fingers along, 1 for each time you say your mantra. They are used to help you keep count without breaking your concentration. Create a special spot designed to help you completely relax and chant in. Make it as comfortable as you can and light a candle to help set the mood. Harness the power of nature and use an essential oil like rose, ylang-ylang or sandalwood on your pulse points or in a diffuser to invoke feelings of deep harmony and love. Chant mantras daily, twice, if you can, once in morning and then again in the evening is preferred. The subconscious mind is most open for suggestion, first thing early in the morning and last thing before you go to sleep at night. Keep focused on your own personal growth and self love. Make sure that you are taking the time to take care of yourself in deeply loving ways. This includes how you take care of yourself physically and mentally and all the people that you surround yourself with. Avoid toxic relationships that don’t respect your boundaries, and spend more time with those that are, loving, kind and value you in all ways. The more you can get into this same vibrational energy, the more attractive you will be. In order to attract and manifest your perfect match, being devoted to saying your mantra daily is key. While many consider using mantras for love as magical, they are not a magic wand. It took years to install your old beliefs and it will take dedication and a consistent effort to integrate new ones into your belief system. 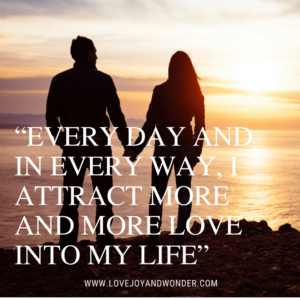 Focus on all the positive ways your mantra is working to draw more love in to your life. Practice awareness, and keep yourself open to receive all the different kinds of love that the universe is sending you on a daily basis. If you feel called to do so, feel free to write your own mantra to chant. Just remember to apply the same rules to your mantra that are mentioned for English or Non-Sanskrit mantras, you must really get into and embody the feeling and the energy of what you wish to attract. Love mantras can make you magnetic, but you still have to take the steps you need and put yourself out there. Go online, join a singles group, get yourself out into the world and have as many new experiences as you can. And lastly don’t forget to be emotional and get into the feeling, soaking up the energy of love and enjoy manifesting more of it in to your life! Until next time much love to you! I hope you found this helpful, and don’t forget to pin it on Pinterest!